Before the advent of modern kitchen appliances and cabinetry, the iconic Hoosier cabinet was a staple in American kitchens. 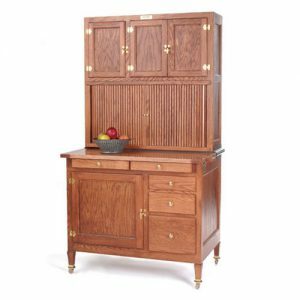 The first Hoosier-style cabinet was made by a furniture manufacturing company named Sellers in 1898 in Elwood, Indiana. Sellers later moved to New Castle. 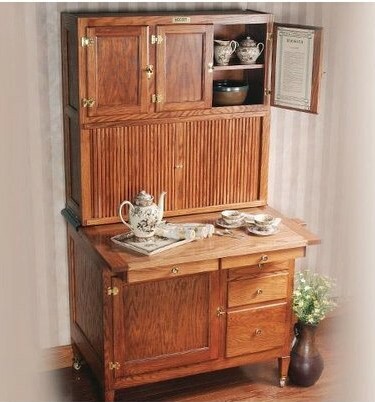 Between 1898 and 1949 there were several dozen manufacturers of Hoosier-style cabinets. One of the manufacturers was the Hoosier Manufacturing Company of Albany, Indiana. After a fire, they moved to New Castle and at the height of production were making nearly 700 cabinets per day. Many contribute the name of the cabinet to this company, while others contend it is named after the nickname for Indiana as that is where most of the cabinets were manufactured. Hoosier cabinets were more than just a cabinet; they were a must-have in most homes. 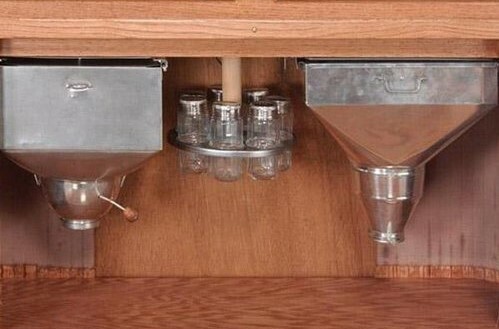 The cabinets not only stored kitchen staples like flour and sugar, they also held workable utensils inside. Most Hoosier cabinets housed flour sifters, Lazy Susans for spices, bread boxes, and even meat grinders. The typical Hoosier cabinet had a large base, sometimes on casters, with a pull-out work surface and several drawers. The top was narrower and had several cabinets and drawers and usually one compartment had a roll-top or tambour. 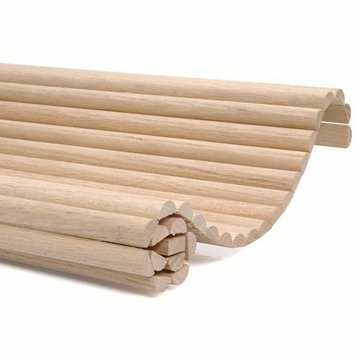 Most were made of oak or other solid wood. The Hoosier cabinet began to decline in popularity after World War II when more modern appliances began to emerge. Woodworkers today are restoring these ol d cabinets and building new cabinets after the Hoosier style. 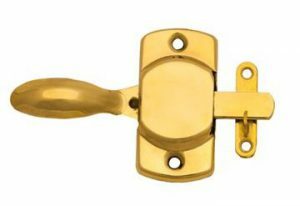 Van Dyke’s offers a wide selection of Hoos ier cabinet hardware and accessories including hinges, casters, tambours, glass jars, cabinet latches, knobs, and more for those who are restoring or rebuilding these pieces of Americana. We also sell two models of Hoosier cabinets – a standard cabinet kit and a deluxe model with flour bin, sugar bin, and 7-hole spice rack with jars, metal bread box, meat grinder attachment, and cookbook holder. Our 1925 Hoosier Beauty Standard Kit features a sliding tambour door. This American Classic was featured in the July 2014 issue of This Old House magazine.